1. Today marks the start of...you guessed it, finals week. The least favorite week of college students everywhere. But Ryan makes everything better, right? 2. I am so relieved to be done with classes for this semester. I don't know if anyone else had a similar experience, but this semester seemed so long for some reason. Not only was it a rough one emotionally, but let's just say I didn't quite have a "favorite" class. On the flip side, I'm excited about all the creative + fun classes I'm taking in the fall. 3. The Shorts are now in my weekly rotation of outfits, due to both how warm it's been and how much I'm loving wearing them. I need to buy more so I can stop being that girl who wears the same thing religiously. 4. My roommates and I celebrated the last day of classes with a conglomeration of carbs at Panera. Double chocolate chip nut cookie was consumed. 5. In case you need another excuse to procrastinate (beside reading this post), here's some of my favorite finals memes, including this brilliant Frozen inspired one. 6. The MAC Red lipstick that I picked up in New York is amazing. I wore it to a play, then to a dance afterwards, followed by some midnight chocolate cream pie eating with my roommate. And it. stayed. allllll. night. No reapplication necessary. You guys, that is HUGE. If you've ever worn red lipstick, you know it's annoying as heck, smears on your face easily, and comes off as soon as you eat or drink something. Not this baby. I did apply Kiss Me Quick lipliner all over my lips first, but still...impressive. 7. This song has been on repeat lately. Because I am a 90's child. And it's finals week. I need upbeat music! My go-to Pandora stations for staying awake: Today's Hits, Justin Timberlake + the Wicked Broadway Cast. Best of luck and blessings on your finals, friends, if you're taking them! How's your week going? What songs are you studying to? I love recommendations! You have no idea how happy your 90's reference made me. I've gotten a weird spasm for listening to 90's music since last week. :) I don't usually listen to it, but it just brought so many memories back of being a little girl. <3 Have a lovely day, and keep at it with those finals! Yay, haha, it must be something in the air. I've been nostalgically revisiting old 90's favorites the past week too! Thanks, lovely, and you too! Some great photography and writing ones! Thanks, Grace! You should get your package soon! Oh my goodness, Ryan. Stop tempting me, darn you. 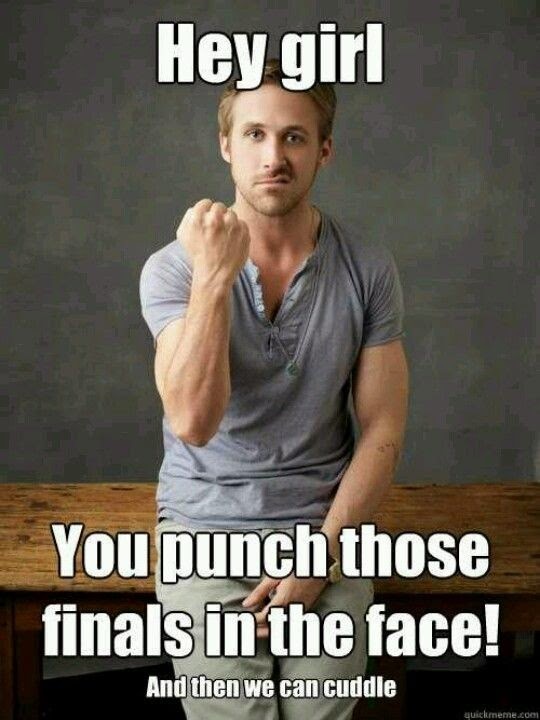 Ryan Gosling memes are the only good thing about finals...and the Spice Girls are so fun! I love your Wednesday posts Grace! I just finished classes today too and am having a bit of pre-finals excitement to bust through this week. :) I usually listen to classical music when I study--kind of cliche, but it seems to help... I really like the Four Seasons and Bach's Brandenburg Concertos. You're in my prayers! Good luck!!! Oh, my goodness, hello, Sarah! Your comment was such a lovely surprise - it's so good to hear from you! And thank you, I'm so glad you enjoy the Wednesday posts. :) I don't think classical music is cliche at all to listen to while studying. Good luck with your finals also! Broadway all the way for my studying! Spring Awakening and Wicked got me through re-learning macroeconomics. I finished my finals on Monday, but I'm rooting (and praying) for all of you still in the trenches! I feel the same way about this semester. Really long, emotional and drama filled, no favorite classes, lots of extra-curricular responsibilities..... And the hardest finals week I've had so far (starting tomorrow, but it feels like it's been going since Sunday). Ah, so ready to be done.